Moses - Truth, Aaron - Kindness, come together. The commentators explain the verse in the following way. When people are truthful, they elicit Kindness from heaven, and the two meet. 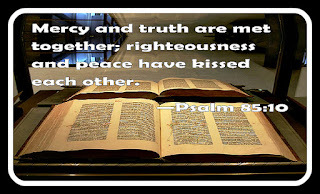 This combination of truthfulness and kindness, takes pure justice and turns it into peace, which draws even more righteousness (Tzedakah-Charity) from heaven. The Midrash says, Aaron – Moses’ older brother, represents Kindness and “truth” is represented in Moses. Unfortunately, “Truth” as important as it is, is not very welcome in this world, which is a world of falsehood. For that reason “truth” recommended, that G-d, not create this world. On the other hand the measure of Kindness, recommended that G-d create the world, since “kindness” is also appropriate and relevant in a place filled with deceit and lies. Moses, because of his special feature, that of truth in the purest sense, was aloof and at a distance from common people and from the world at large. Therefore, when he passed away at the age of 120, the community at large did not feel his loss. While when Aaron passed away at the age of 123, as the person characterized by kindness, and therefore connected even in places and with people of deceit, “the entire house of Israel” mourned him. Moses, because of his characteristic of truth, was able to be the intermediary between the G-d of truth and this world. Only Moses was able to receive the instructions from G-d in order to transmit them to Aaron. Moses could never communicate with a person like King Pharaoh, the King of the most lewd and lascivious country of the time. Aaron and his virtue of kindness was able to reach so low a point as communicating and transmitting the message to King Pharaoh. Aaron was the spokesperson of Moses and received all his knowledge and wisdom from the only one who was able to receive it himself from G-d, Moses. All the Israelites recognized this dynamic, that all the instructions originated from Moses. Yet, when Moses passed away, it did not make the impression on the Israelites, as did the passing of Aaron who was connected to everyone. These two very special characteristics and virtues are not the domain of two separate people. Moses had kindness and Aaron had truth. The reason why G-d chose Moses as the leader of His special chosen nation was because of his absolute commitment to truth, the hallmark of Moses and yet Moses as a shepherd demonstrated kindness and mercy even toward a weak goat, which so impressed G-d.
Aaron, although he was characterized by kindness and reaching out to make peace between husband and wife warring factions, he never compromised on the “truth” and was always clear on the parameters and limitations set by the rules of the Torah. When reaching out to the common people, one must BRING THEM CLOSER to the Torah of truth and not the other way. Moses was more emphatic on truth and therefore he was the one able to connect with G-d to bring G-dliness down to the world. Aaron because he was stronger on the kindness side he was able to better connect with ALL the people. Everyone has their own G-d given strengths that serve their own very unique mission they, were sent down to this world. Trying to mimic someone else, confuses the plan, complicates the person’s life and most important misses the bull eye. Discovering ones unique strengths and Divine purpose, and contributing it to make the world a better place is the lesson we learn from the same, yet different lives of Moses and Aaron. Everyone – even the dead can bless. A Tzadik is someone who refined all areas of his life to such a point that there is no coarseness that would block the spiritual shine of G-dliness from his soul, to his consciousness and in his physical existence. When a Tzadik talks, you are receiving pure G-dliness. Everyone, man or woman, has the power of blessing, because everyone has a spark of G-d within himself or herself. 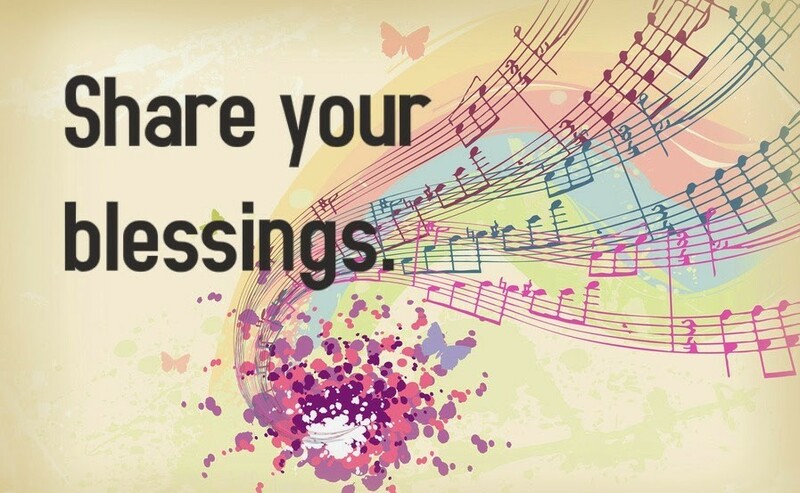 When someone blesses another, they are literally sending a positive energy of and from themselves, in the way of that blessing to the ones being blessed. In addition, there is the time in which a blessing is said, i.e. on Shabbat and before Yom Kippur. There are days and moments that blessings have the assistance of reaching their mark more effectively because of the special qualities in that moment. There is also, who might be responding Amen to the blessing which further strengthens and confirms the blessing and positive energy generated by the one making the blessing. There are times that a good Angel is listening and he might answer Amen (pretty powerful). That is why we are told, “Never take anyone’s blessings lightly”, because it is not just who is blessing but there is also the time, the place, and the other one answering Amen. 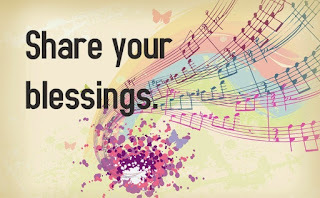 They all play an important role in the success of the blessings outcome. A true Tzadik is the embodiment in all ways, whether in character, mannerisms, behavior, and power, of G-d Himself. It’s no big deal when a Tzadik knows the future, or through his blessings a terminally ill person is miraculously cured. This is after all the power of G-d being channeled through this incredible elevated human being, and it knows no limits. That is why traditionally and throughout history, people would go through much difficulty to receive the blessings of a Tzaddik. Notwithstanding all that we just talked about, the Tzaddik is still finite, and limited by the constraints of his body and time. Once the Tzaddik however passes away and like everyone else, his soul ascends to the spiritual realms he is no more restricted by the confines of the worldly limitations, and still very much remains a Tzadik. He continues to look after his students and followers, and continues to bless them, but now, everything is on a much more expansive level and possibility. When a person very innocently and with a pure heart goes and visits the burial place of a Tzaddik he is able to connect on a very deep level with the Tzaddik. One very good moment, is every year, on the day the soul finished its journey on the face of this earth, and ascended to heaven. Every year on that date, the soul is strengthened to bless all those attached to him. May we merit soon, “They will arise and sing, all those who lie in the earth’’. True meaning of Prayer. Prayer, is the vehicle to elevate all parts of our soul and being, to become attached with the groom. The Menorah that was lit in the Temple represented the light that shines from the center of the world i.e. the Temple, to and for the entire world. For this reason the Menorah also represents the Torah – “the Torah is light”. Just as the actual Torah was brought down to this world by Moses who represents wisdom, so to it was Moses who was commanded to make the Menorah, since the menorah, light and wisdom was his thing. Aaron (Moses’ older brother) as Priest, represented the other pathway to G-d, that of worship/service and prayer to G-d. Therefore, it was Aaron who was commanded to prepare the Menorah, and to light it. The making of the menorah and “potential” for creating and holding light isn’t enough; it has to actually be lit, so the original intended purpose for making the Menorah is brought to fruition. If someone merely brought the ingredients to make light, oil and a wick, this isn’t yet a functional candle. The wisdom of Torah in itself isn’t the ultimate. It is only when the light is ignited and the wisdom actually sheds its brilliance and clarity on a person, in his life and his surroundings that the goal has been reached. This is accomplished by the spiritual service represented by Aaron, prayer. The light, is the result of the oil and the wick being consumed. The more A) oil and wick B) being consumed, the greater is the fire. The first step in creating light is to stack up on the ingredients for light A) – the knowledge, wisdom and Torah. Maimonides writes, “ It is a well-known and clear matter that the love of God will not become attached within a person's heart until he becomes obsessed with it at all times as is fitting, leaving all things in the world except for this. This was implied by the command [Deuteronomy 6:5: "Love God, your Lord,] with all your heart and all your soul. When a person is praying, B) meditating deeply and intensely concentrating on the words prepared according to the structure designed by our great sages, specifically the Men of the Great Assembly, this will bring them to a state of B) self-abnegation. A state where they will deeply cherish the G-dly and the spiritual and will yearn for more. More of the awareness that all that is physical is merely small and insignificant, and many times counterproductive expression to the experience of G-dliness. They will therefore care for less of the physical and more of what has, and is, of eternal value. The more a person has studied the Torah – “Torah is light” and the knowledge of G-d, and realizes the infinite greatness of G-d he/she will be filled with an immense joy and happiness (through prayer & its meditations) that he/she is able to approach G-d in any way whatsoever, only by observing His commandments. In our “prayers” we ask G-d to, “open our heart in your Torah” and wisdom. We are not asking for more brain clarity, but for more sensitivity, breadth and depth of the "heart". That is because in prayer, the person realizes that unless his wisdom of the Torah is able to affect his soul and his personal life nothing important was accomplished. At this point the person desires that his emotions be fired up with enthusiasm that will move him/her, and shed the light in his life on, and for, the things that matter. That is why in mysticism the “best man” of the congregation of Israel is, Aaron. 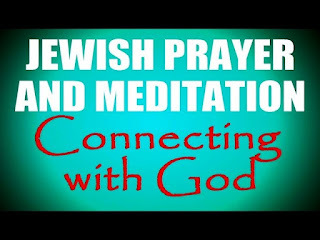 Prayer, is the vehicle to elevate all parts of our soul and being, to become attached with the groom, Almighty G-d,the source of all that is blessed and good. Over the gallery doors in the US House of Representatives chambers of Congress are twenty-three marble relief portraits of famous lawgivers, among them —the celebrated Jewish scholar, physician, philosopher, and community leader Rabbi Moshe ben Maimon HaSefaradi. 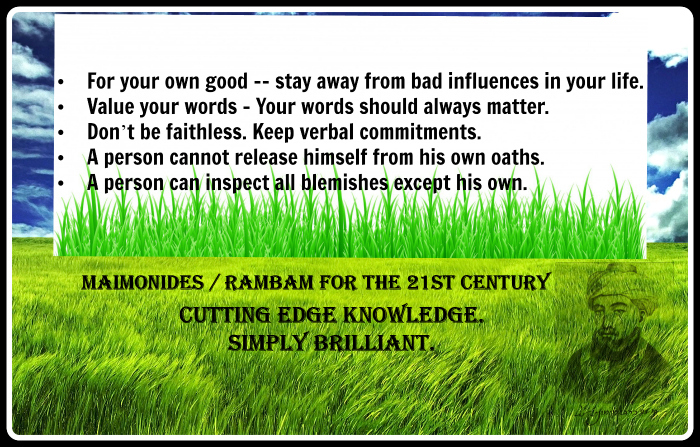 Though most know him as Maimonides or by the acronym “Rambam,” his full name reminds that he was a Sephardic Jew and a subject of the Almoravid Empire. He was born in Cordoba in 1135 - 1204, which was then part of Muslim Spain; much of his commentary on the Torah and Jewish religious law were written in Arabic or Judeo-Arabic. A prolific scholar, his many works cemented his place one of Judaism’s most important philosophers. Maimonides's insights on Jewish ethics and religious law continue to exert a profound influence upon Judaism today. The following are some examples of Jewish Law included in Maimonides’ Magnum Opus – Yad Hachazaka - The strong Hand. For your own good -- stay away from bad influences in your life. Value your words - Your words should always matter. …What is the source which teaches that it is forbidden for a person to take even these four types of vows which are permitted with the intent of nullifying them? It is written [Numbers 30:3): "He shall not desecrate his word," i.e., he should not make his word an inconsequential matter. Don’t be faithless. Keep verbal commitments. When a person agrees to a transaction with a verbal commitment alone, it is appropriate for him to keep his word even though he did not take any money at all, did not make a mark on the article he desired to purchase, nor leave security. If either the seller or the purchaser retracts, although they are not liable to receive the adjuration mi shepara (A curse on one who reneges on an agreement) they are considered to be faithless, and the spirit of the Sages does not derive satisfaction from them. When does the above apply? With regard to a small gift, because the recipient will depend on the promise that he was given. With regard to a large gift, by contrast, the giver is not considered to be faithless if he retracts, because the recipient does not believe that he will give him these articles until he transfers ownership through a formal kinyan. A person cannot release himself from his own oaths. It is not possible for a person to release himself from his own oath. A person does not have the license to release an oath or a vow in a place where there is a person whose knowledge surpasses his own. In a place where his teacher is found, he may only release a vow with the consent of his teacher. A person can inspect all blemishes except his own. Everyone can become impure due to tzara'at (A supra-natural bodily affliction often mistranslated as leprosy) blemishes, even a new-born baby or servants, but not gentiles or resident aliens. Anyone is acceptable to inspect such blemishes. A person can inspect all blemishes except his own. At the very essence of matter are we waves of energy or defined particles? Miracles - undefined, or nature - defined? Knowledge is Power - G-dly Knowledge is SUPER Power. Most likely this story was first recounted by Maimomides himself to his son Abraham, who then told it over to his son, David. The question is. The Mishneh Torah of the Rambam writes in more than one place, dreams don’t improve or worsen a situation. Basically, they should be ignored. So why be impressed with a dream concerning Moses and Maimonides? Another point to ponder on. Rambam wrote Avel 4;4 “ a person should not turn to visit cemeteries”. And yet, Rabbi MM Schneerson who prided himself as being a devoted student of the Rambam, specifically instructed people to go to the Rambam’s own burial place in Tiberias on special occasions! How can (spiritual) dreams mean something and not mean anything? How could going to a cemetery recognizing the power of the soul mean something, while Rambam talked about not going to a cemetery? How does an ark take up space, and not take up space, at the same time? It all depends, on the observers own power of perception. The two tracks and two statements are both true and, it depends! At the essence of everything is the power of the infinite where there is no beginning and no end. There are no boundaries and there is exists all possibilities. Not everyone can tap into this very exalted level. And then, G-d created a Universe in seven days that is measured to specific specifications. 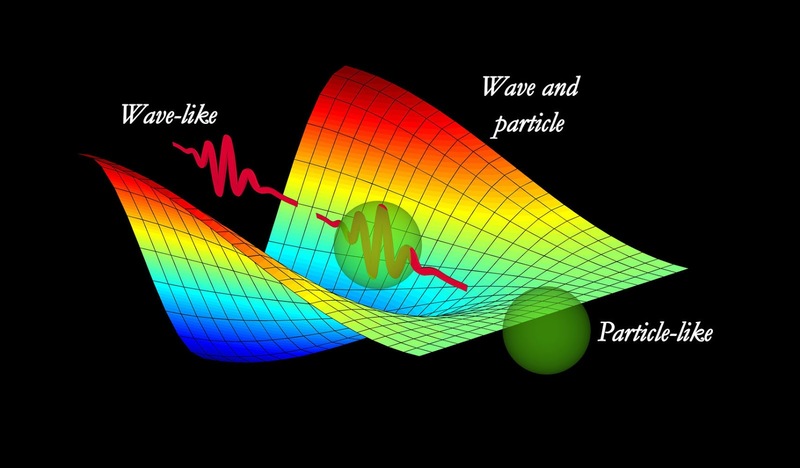 When a person focuses on the created universe he sees particles. Measured entities. Possibilities with finite characteristics. The other choice Is, when a person elevates his/her awareness through prayer, Torah, and the service of G-d, they connect and tap into the source and energy that started it all, and then even vinegar will light like olive oil for an entire Shabbat. Ta’anis 25, Story with Rabbi Chanina Ben Dosa.